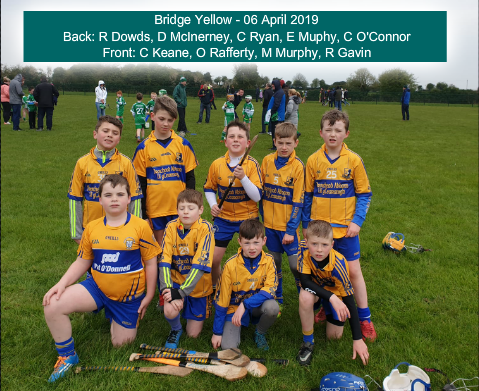 A windswept Caherlohan was the venue for the Sixmilebridge U10 hurlers to kick off their season in the now traditional Monster Go Games Blitz hosted by Clare GAA. With 13 teams involved in the morning session and a further 15 in the afternoon session, running this blitz is an impressive logistical feat - many thanks to all who helped organize it. The 'Bridge squad was severely depleted with many of our players making their First Communion this morning and a couple of coaches nursing injuries after a high intensity bagpacking workout in Dunnes on Friday. 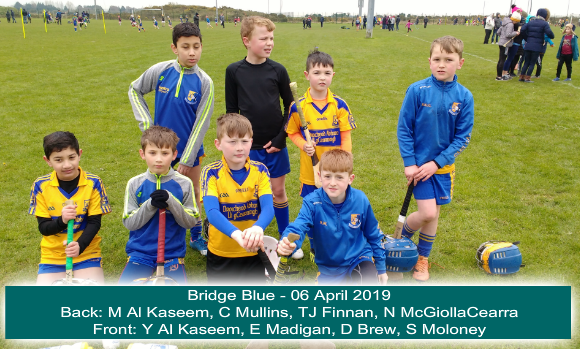 The Bridge fielded two 8 aside teams with Bridge Blue playing Feakle\Killanena and The Banner while Bridge Yellow played Scariff\Ogonnelloe and Ballyea. Both teams acquitted themselves very well and are looking forward to many more blitzes throughout 2019. Next blitz takes place on Sat May 4th. Congratulations to all our players who made their First Communion this weekend. Finally, míle buíochas to our Under 10 parents who volunteered in the bagpacking fundraiser in Dunnes Stores #buildthatarena !